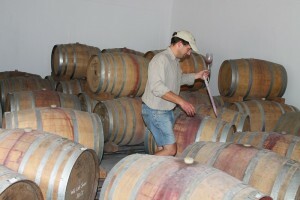 During our month in South Africa, we had the opportunity to visit many wineries and try a lot of wine. I think my overall favorite varietal was a barrel fermented Chenin Blanc. 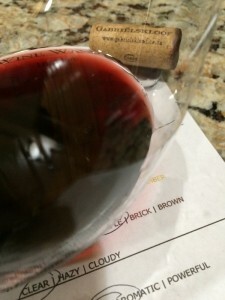 I loved the mouthfeel, and how full-bodied it was. Of the reds, I think the Bordeaux blends were my second. 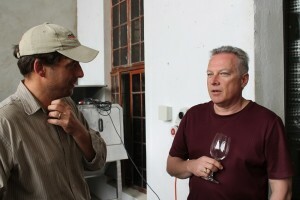 We had the opportunity to meet past winemaker of Gabriëlskloof Wine Estate, Kobie Viljoen. Kobie has his own label now and he also is a winemaker for various growers in Elgin area. He was a very friendly guy and offered to help me in the future when I make my wine. Slightly aromatic with young-fruity notes of ripe fruit and spice. Dry, full-bodied with lively acidity. Tannins were soft. Rich mid-palate with an oaky leather long finish. 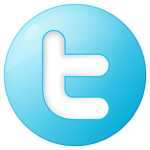 Region/Appellation: South Africa, Bot River. Blend: 36% Cabernet Sauvignon, 24% Cabernet Franc, 21% Merlot, 10% Malbec, 9% Petit Verdot. 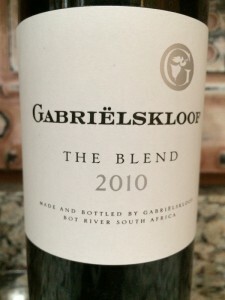 I rated the 2010 Gabriëlskloof The Blend three glasses. I was able to try some of Kobie’s wine during our visit. They are great and we expect to see them in Minnesota soon. Bill and Kobie talking about the 2016 harvest. Kobie thieving 2015 Pinot noir for everyone to try.